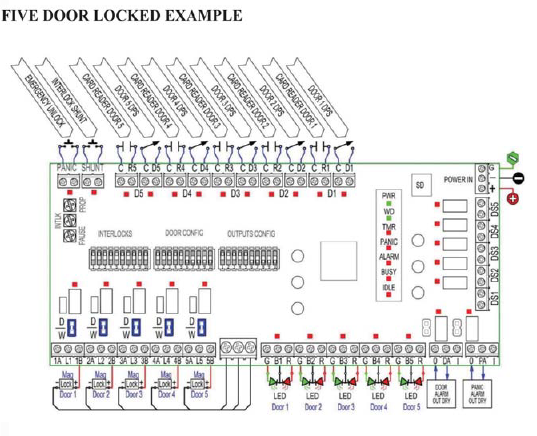 The 4800 PLC interlock controller is a cost effective method for operating door interlock and mantrap systems of up to five doors. The fully integrated controller is a one board solution that allows the installer complete control of all operating and configuration options without complex software. Standard Configuration includes PLC Controller mounted in a 12 x 16 x 4� Enclosure with 4 amp 12/24VDC power supply. Controls 2 � 5 Doors in Any Combination Locked or Unlocked. Suitable for air locks or security mantraps, with up to five normally locked or unlocked doors. This controller may be customized to control automatic door openers and provide custom timing and logic sequences for biological wash-down controls. Other configurations provide outputs for traffic lights, forced door alarms and an emergency panic release input. The 48501 series PLC controller is paired with a heavy duty 4-amp power supply that includes a Fire Alarm connection for emergency egress and can provide power to operate maglocks, electric strikes and traffic lights. The controller is also available without the power supply & enclosure for connection to an existing 12-24VDC power source. Operation �: Only designated doors may be unlocked or open at any time. Unlocking or opening one door automatically secures other designated doors within the Interlock. A request for access at any normally locked door will inhibit the REX inputs for all other locked doors and secure all designated unlocked doors in the area. Lock relay contacts will switch low voltage power to maglocks and/or strikes. Lock outputs can be set for either wet or dry contacts and fail-safe or fail-secure operation. For user feedback designated red/green LED outputs may be selected for either lock status or door availability status, typically a green light indicates that access is permitted, while a red light signals that another door is open and access is denied at this door. There are two designated alarm outputs one for an interlock door violation alarm and one to indicate emergency unlock for a panic release. Other customized operations may be selected to allow adjustable timed sequences for inflating door seals, purging air or timing washdowns. Physical Data: #48501 Enclosure- 12� x 16� x 4� deep NEMA enclosure will accommodate PLC controller & 4 Amp power supply. Dortronics High Intensity LED Indicators Super Bright LEDs for access control applications. These hi-intensity LEDs are highly visible in virtually any lighting condition, including bright sunlight. Door security status can be immediately conveyed to system users and security personnel. Wide Angle Viewing. The large diameter lens on the standard hi-intensity LEDs are easily viewed even from off-center. The weather-resistant hi-intensity LEDs are furnished with an even larger sealed LED lens for maximum outdoor visibility. Interior or Exterior Use The weather-resistant units are ideal perimeter access control gates exposed to the weather. If mounted near card readers, the LEDs can be used to clearly indicate when individual doors and/or gates can be accessed. Perfect for industrial applications, these LEDs are easily seen when viewed from a truck cab or forklift. Compact Size Two LEDs, typically one red and one green will easily fit on a standard single gang wall plate. When mullion mounting is required a narrow 1-3/4� wide plate can be supplied. Easy Universal Installation Standard mounting hardware allows easy installation onto standard single gang junction boxes. All Dortronics LED indicators are field selectable for 12 or 24 volts DC operation. Long Lasting Dortronics hi-intensity indicators are solid-state LEDs manufactured from high quality semiconductor materials. LEDs are noted for their extremely long life and these may never need replacement. In addition, LEDs typically draw only about 5% of the power of a comparable incandescent component, allowing smaller, less costly power supplies. Customized Configurations The 7200 series hi-intensity LEDs can be used in lieu of standard bi-color T-1-3/4 LEDs and factory applied onto double or triple gang switch plates with any of the Dortronics standard push buttons or key switches. Other configurations are also possible using customsized plates. Contact the factory for assistance in determining the exact size of custom plates. Optional Piezo sounder Available with either indoor or Weather proof outdoor Piezo mounted on the plate. We have found this manufacturer to be extremely user friendly !